Giant Arborvitae "Virescens" is an "intermediate" screening tree--most of its screening is in the lower half (see photo). Not as small and cylindrical as the "Emerald Green" Arborvitae, but also not as wide and tall as the Excelsa Cedar or the Leyland Cypress. 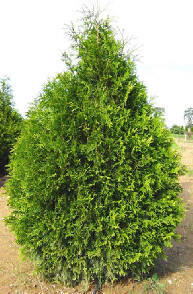 The Giant Arborvitae "Virescens" are fast-growing and can tolerate wetter soil. 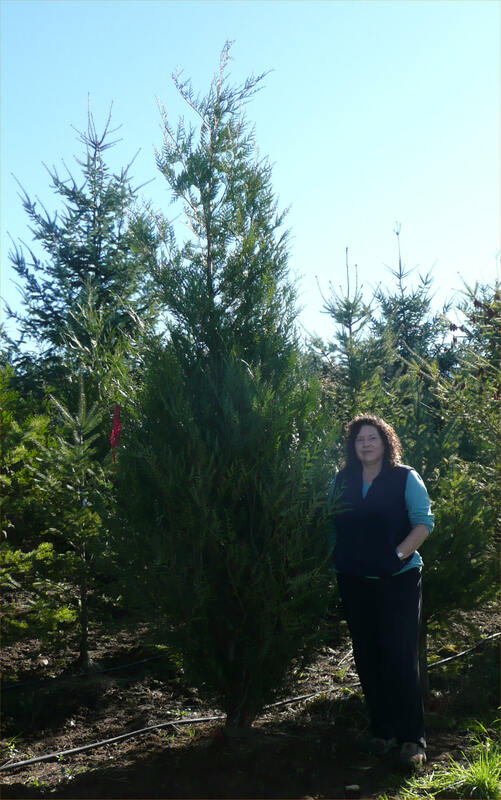 Because these Giant Arborvitae "Virescens" are such big trees, our customers usually have us deliver and plant them. We deliver and plant trees throughout Washington: Seattle, the "East Side", Bellingham, Vancouver (WA), east-of-the-mountains, etc. Contact us for free estimates: info@NurseryTrees.com or (425) 343-2650. Mature Width: 10-12 ft. It has a "tear drop" shape, as in photo above. Growth Rate: Medium/Fast, up to 2' a year after established, depending on growing conditions. "Instant Privacy" Spacing: Usually planted on "4, 6 or 8' centers", meaning the trunks of each tree are 4', 6' or 8' apart. So if you're trying to cover 40' with trees on 8' centers, you'd need 6 trees (the first one at "0" ft. on one end, and then one every 8' after that). Some people want them even closer than that in order to maximize the 'Instant Privacy", while others will put them wider in order to cut down on the cost. Also look at staggering two rows if you have the room--maybe 10' centers, and then a row behind that fills in the spaces--this is good for the trees as it gives them more room, but it takes up more space in your yard. What to Expect the First Year: As with all newly-planted trees, these need to be watered carefully through the first Spring/Summer--see our "Care of Your Trees" section for more details. Not as much growth the first year because the tree is putting its efforts into its root system. Some small branches that were broken during installation will turn brown (cut them off or just leave them and they will fall off). Comments: A good choice if you simply want a bigger Emerald Green Arborvitae. Maintains its green color all year. Growing in popularity as a substitute for Leyland Cypress. Literature says it is "deer resistant". Not sure which "Instant Privacy" Tree is right for you? Please see our Comparison Chart & Checklist, comparing the mature sizes, growing conditions, etc. of all of our privacy trees.